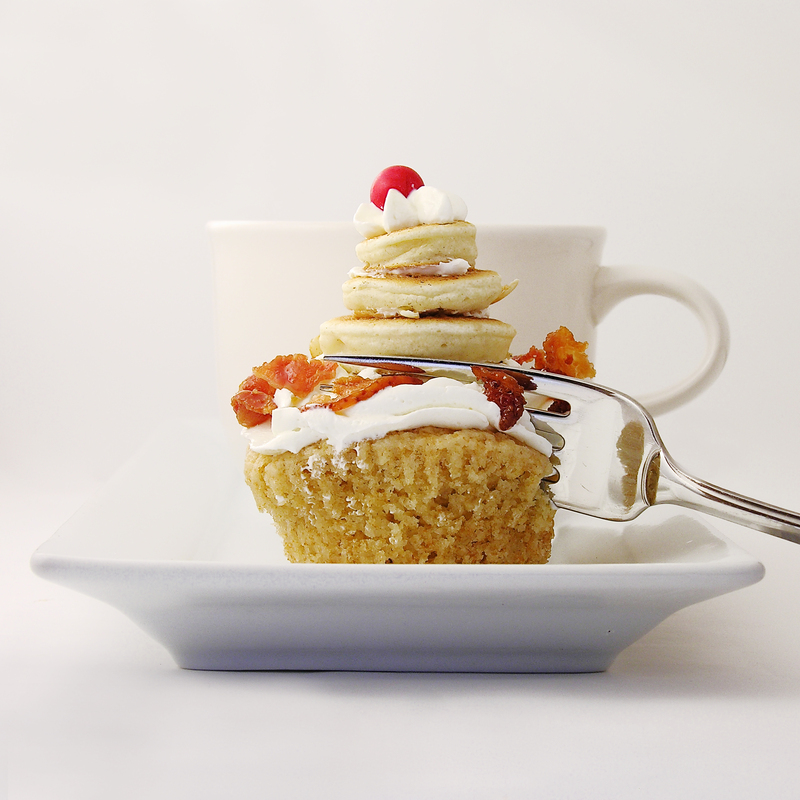 These sweet maple pancake flavored cupcakes are topped with syrup-coated bacon and real mini-pancakes. The only question remaining is, will you eat them for breakfast??? My answer to that question is a resounding YES, I will eat them for breakfast, and any other time of the day too! Pancake batter- enough for about 50 mini pancakes (I used the add water and shake Bisquick bottle, and it took about 2 cups of batter to make these up. 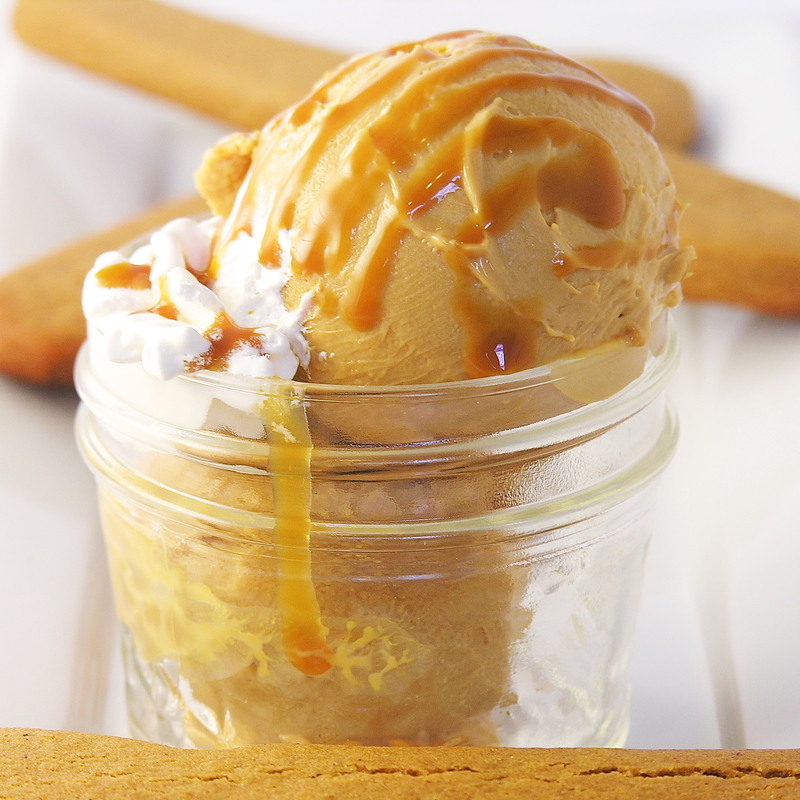 In large bowl, whisk eggs, whipping cream and vanilla together, add melted butter slowly while whisking. 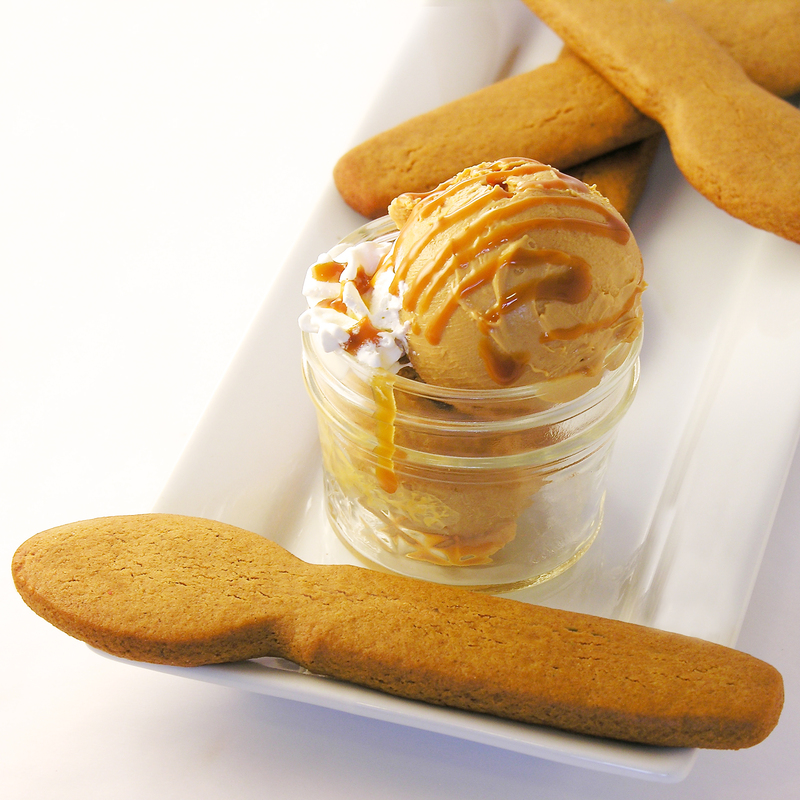 Alternately add dry ingredients and syrup to the egg mixture, whisking until thick and smooth. 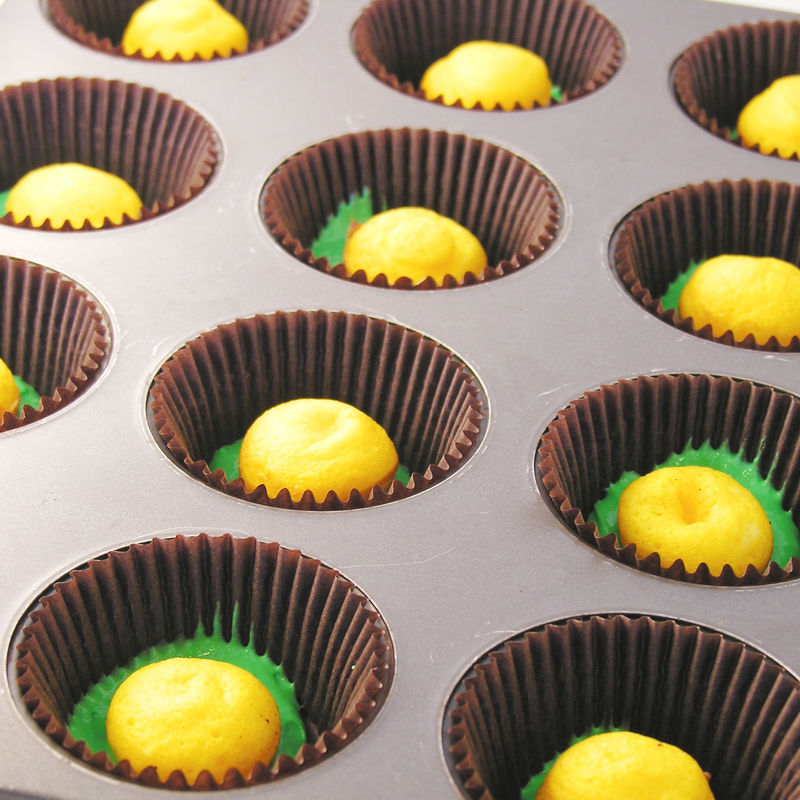 Scoop evenly into 18-20 cupcake liners placed in muffin tins. Don’t overfill! 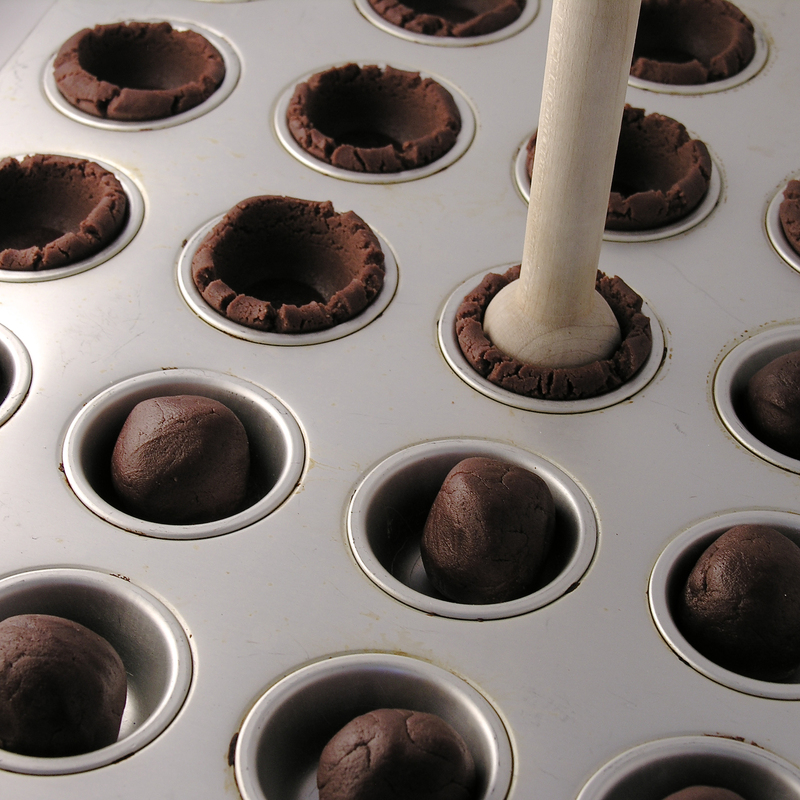 Bake at 350F degrees for 14-18 minutes, until a toothpick inserted into the center comes out clean. 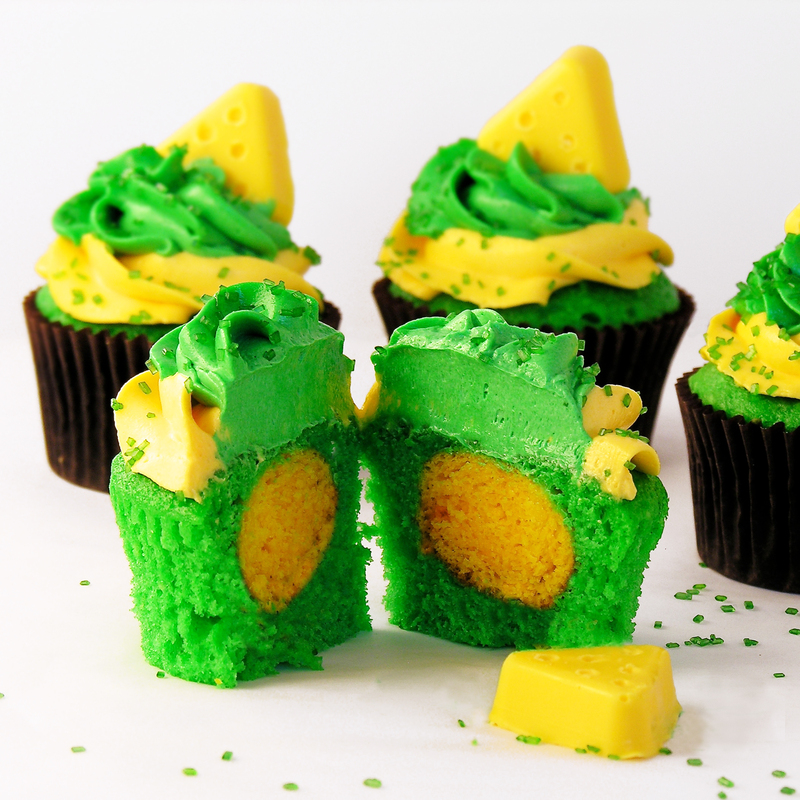 Remove cupcakes from tin and allow them to cool completely. Crumble bacon into small pieces and toss with maple syrup until completely coated. Make mini pancakes on a hot griddle by using a small spoon and making just a tiny circle of batter. Let these cool on a piece of parchment paper. Make frosting by placing butters, powdered sugar and vanilla in a mixing bowl and beating on high for 3-4 minutes until very light and fluffy. 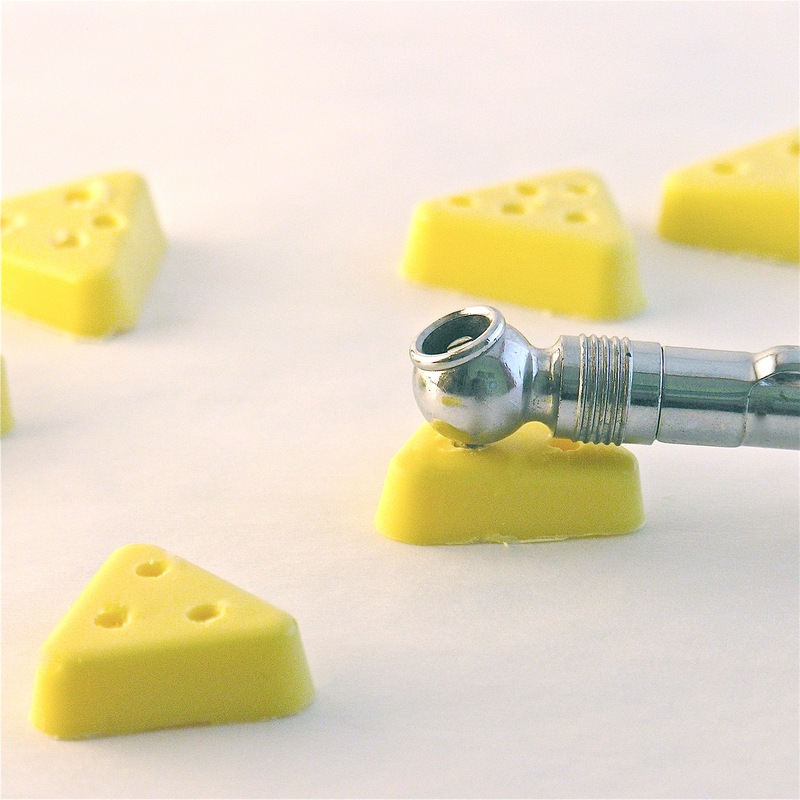 Place frosting into a large zip top bag that has a decorating tip fitted into one corner. Pipe a circle of icing around the edge of the cupcake. Place pancakes on top, using a small amount of frosting to stick them together into a stack. 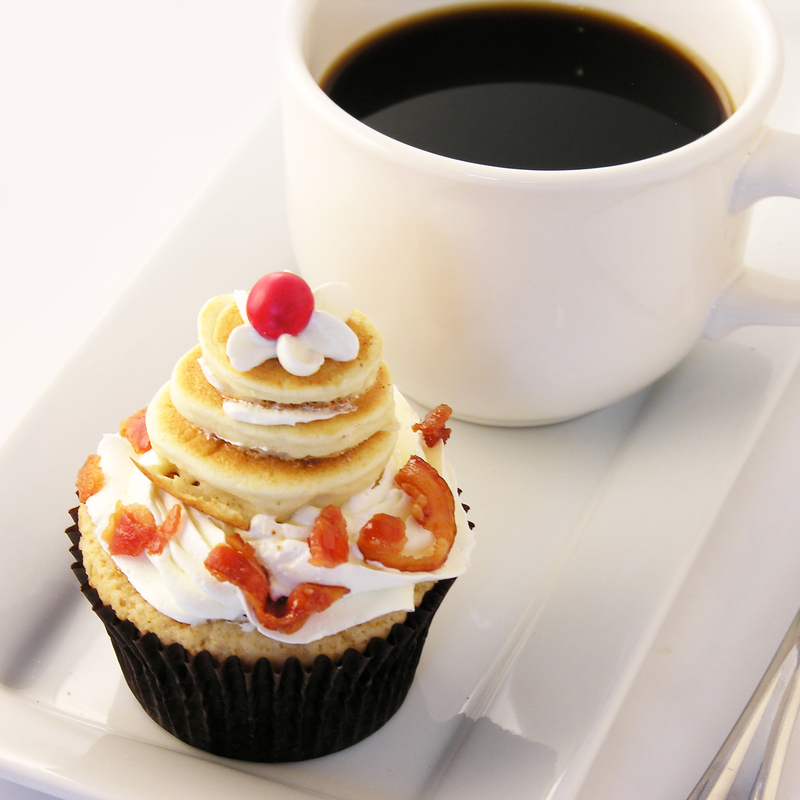 Add a dollop of frosting on top and add sprinkles or a red “cherry” sixlet, like mine. 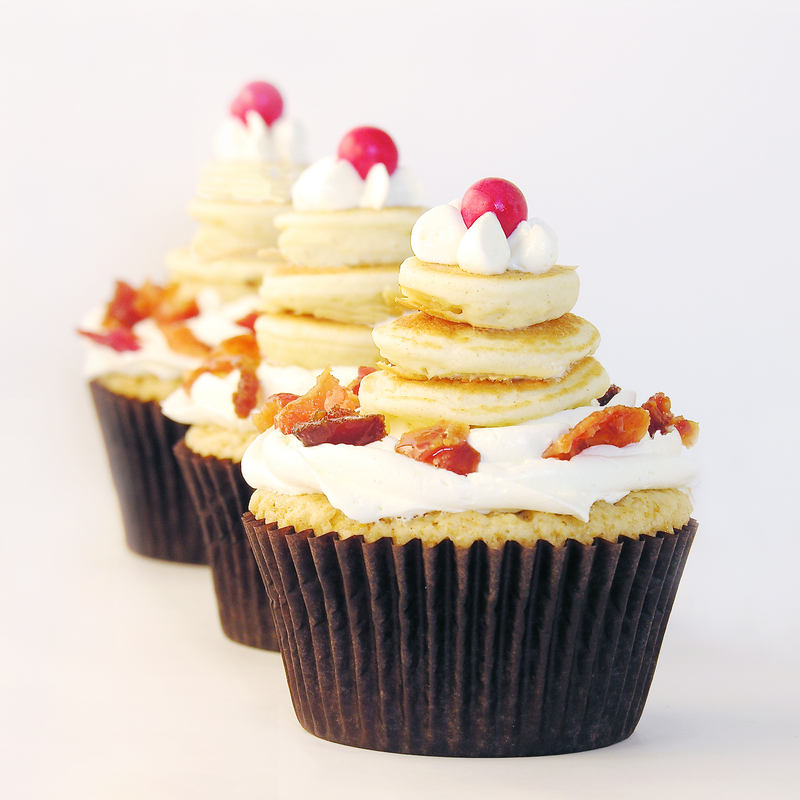 Posted in Cupcakes and tagged bacon, baking, best, breakfast, buttercream, cupcakes, dessert, fun, idea, maple, maple syrup, pancake, recipe, salty, sweet, syrup, unique. Bookmark the permalink. 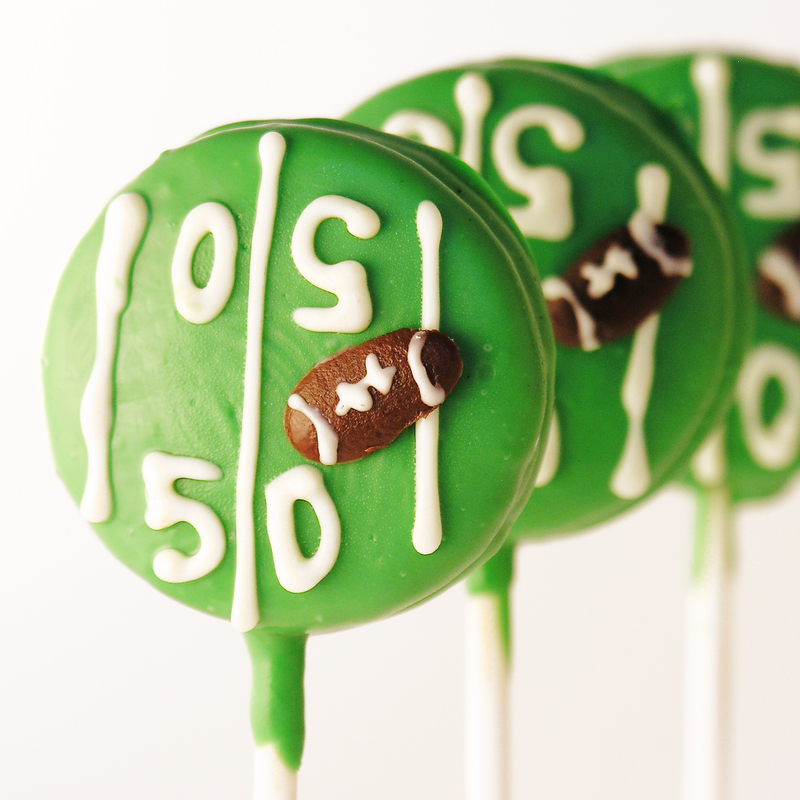 These cute little football field Oreo pops are the perfect snack for your next tailgating party or Sunday afternoon of football! 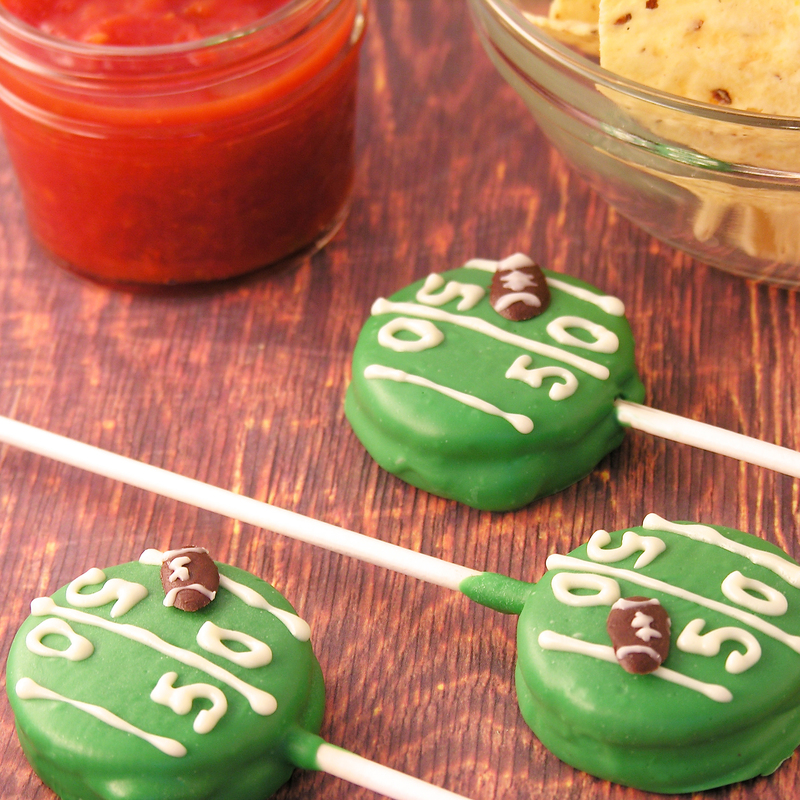 These are just fun little football treats…and the world has far too few fun little football treats– there’s always room for more! 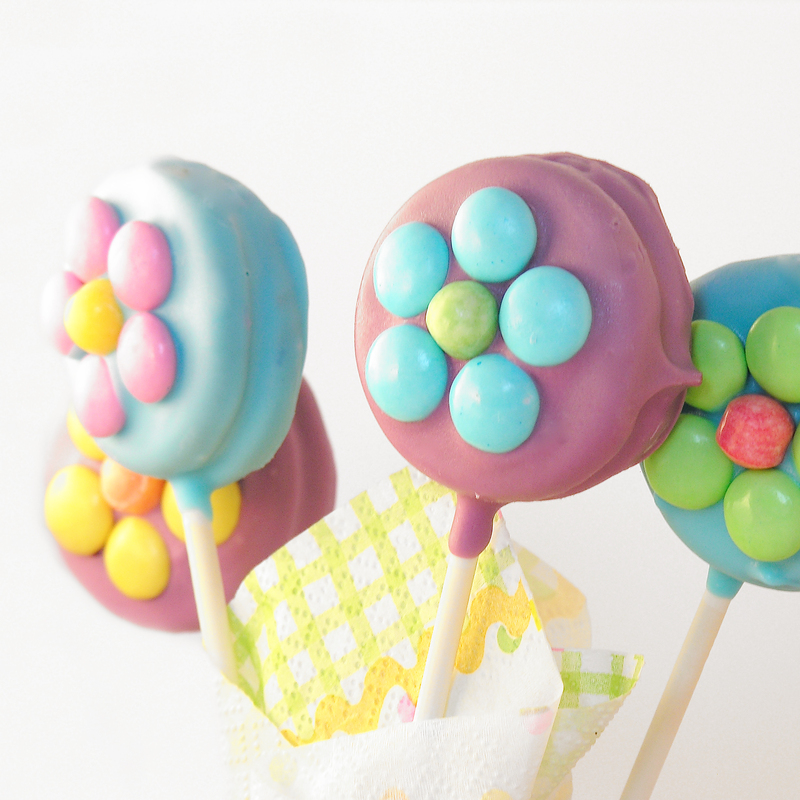 These are made just like all of the other crazy Oreo pops on the Easybaked site. 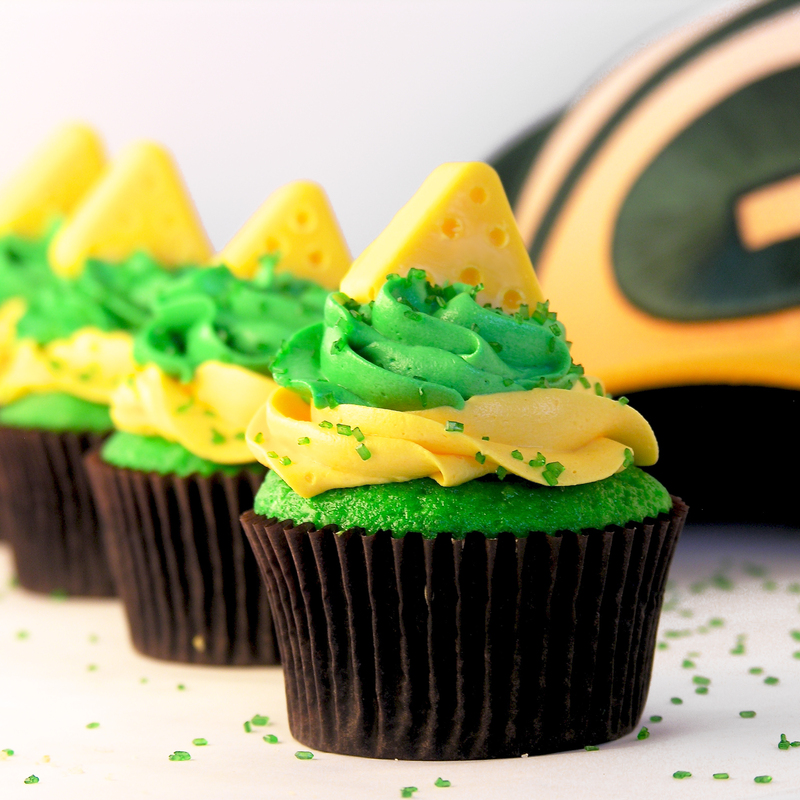 Dipped in green, piped in white and topped with a cute football sprinkle! Melt the about 1/4 of the white Candy Melts in the microwave in 30 second increments, stirring until completely melted and smooth. Dip the end of one stick into the melted white chocolate, drizzle a little in the center of the cookie filling and then gently press it into the indentation made. Melt green candy melts in the same manner that you melted the white. Holding the stick, lower the entire Oreo into the bowl of melted green chocolate, spooning it over the top and sides to cover it completely. Melt another 1/4 of the white candy melts, as before, and spoon into a small zip top bag. Clip a tiny corner off and pipe lines and numbers on the top of each Oreo pop. 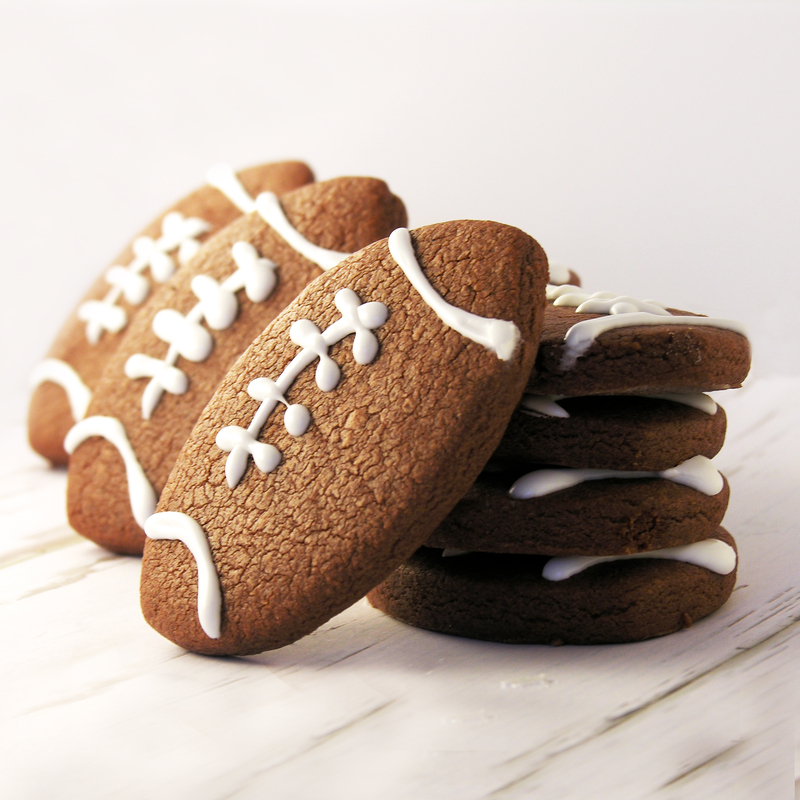 Place on a clean piece of parchment paper to cool, and immediately place a football sprinkle on top. Allow pop to harden completely. 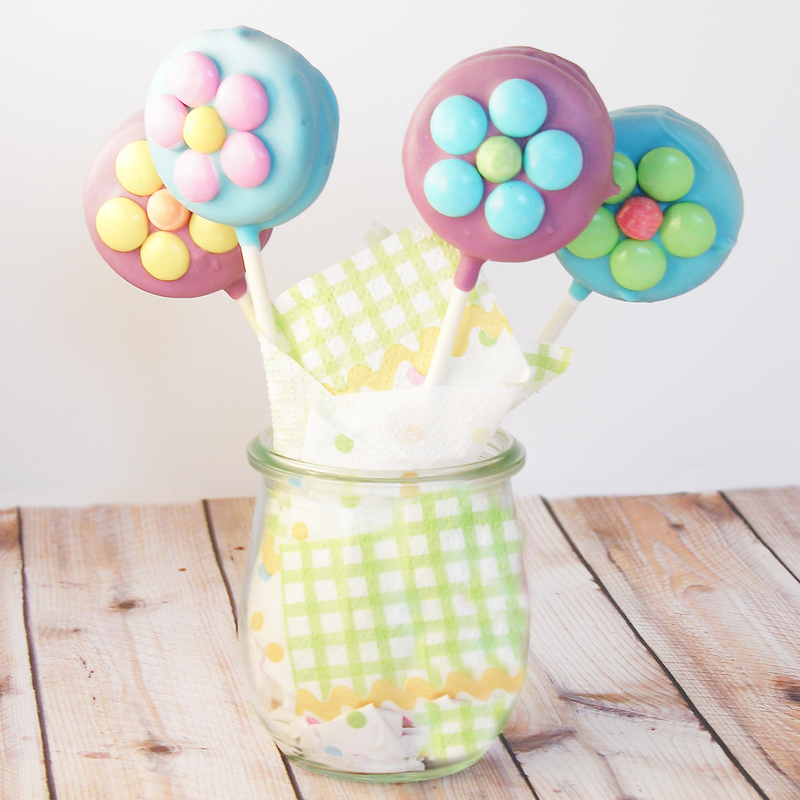 Remove from paper and serve- or place in a small treat bag, tied with a fun team ribbon. Posted in Cookies and tagged best, chocolate, Cookie, dessert, football, football season, fun, idea, oreo, Oreo pop, recipe, snacks, sweet, tailgating party. Bookmark the permalink. 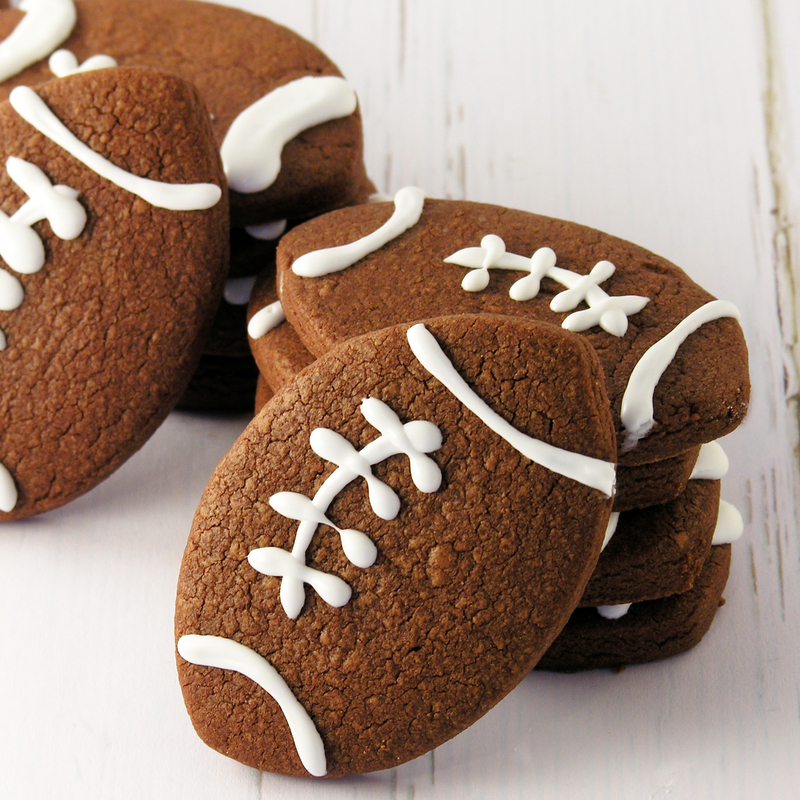 These soft and chewy chocolate cut-out cookies make the perfect little footballs! Are you ready for the season to start? 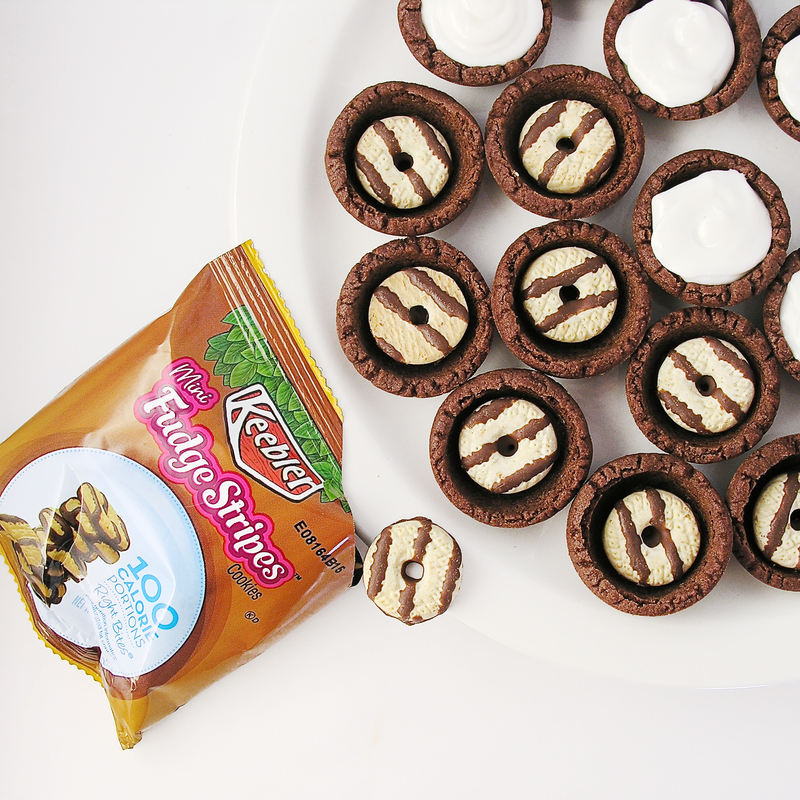 Kick it off with these adorable treats! 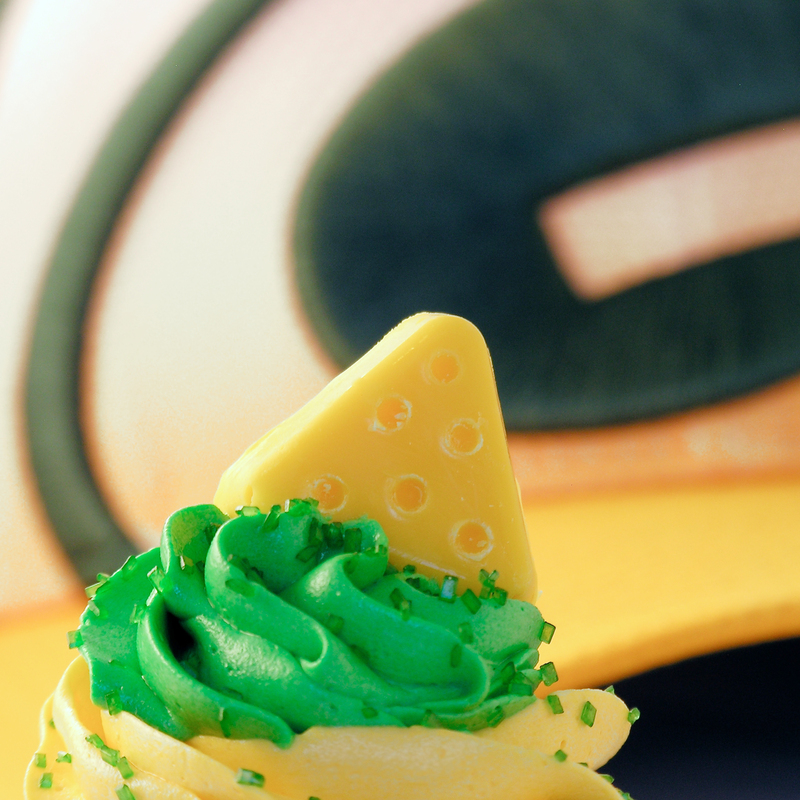 NFL football starts this week with a Thursday night game against the Packers (GO PACK GO!!!!!!) and Seattle. 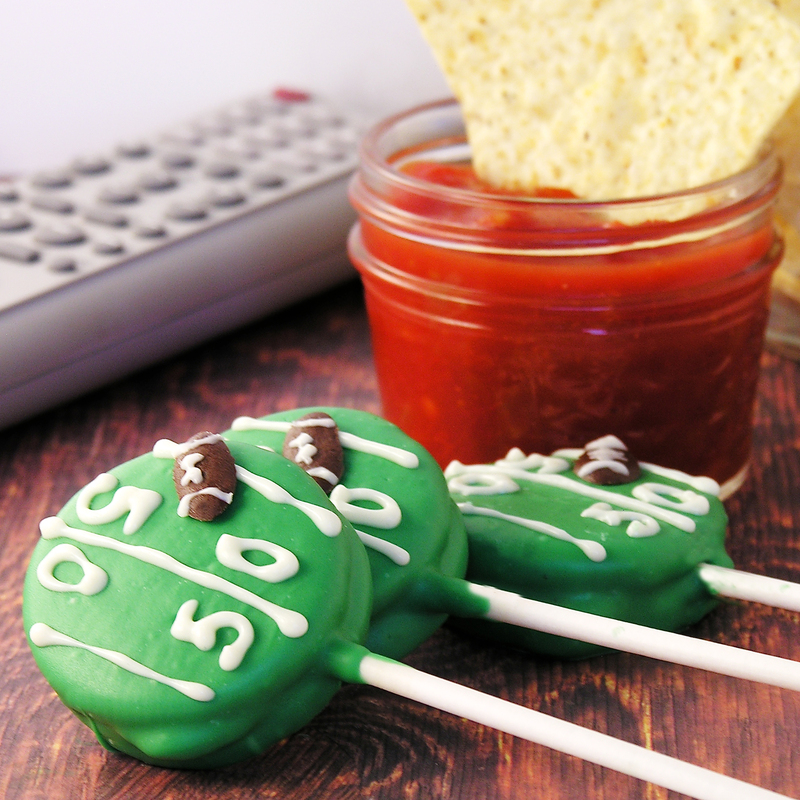 Let the season of fun tailgating and snacking begin!!! These are seriously the yummiest chocolate cookies ever, and the PERFECT, not-sticky, dough for cookie cutters. 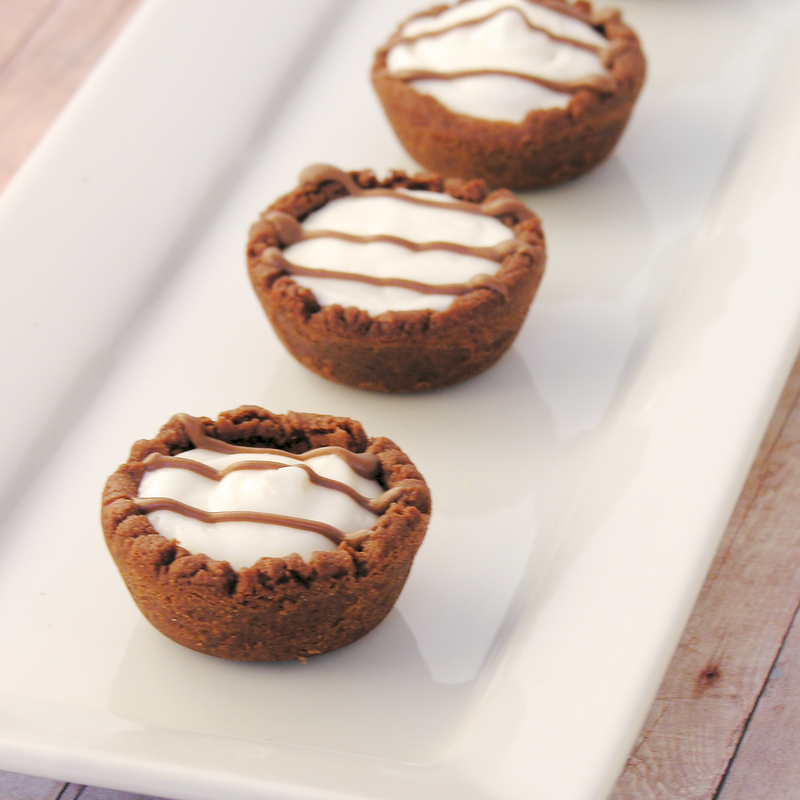 I’ve used this recipe SO many times here on easybaked. When I thought about making football cookies I automatically defaulted to this wonderful family recipe. I promise, you will love it!!! Roll out cookie dough on floured counter. I roll mine thick, so I get nice and chewy cookies. 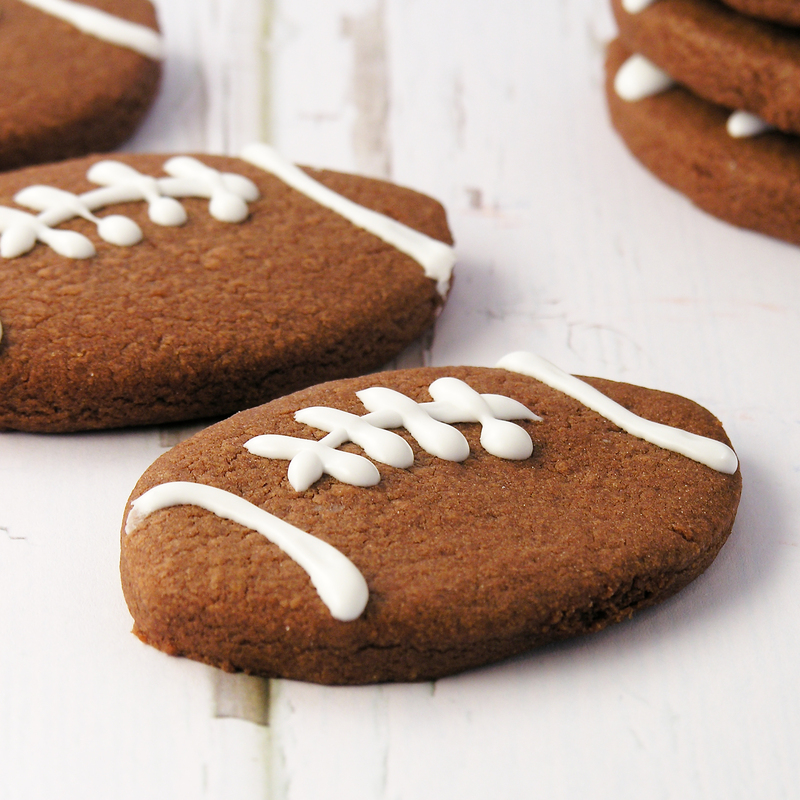 Cut into football shapes using a football cookie cutter and place on a parchment-lined baking sheet. 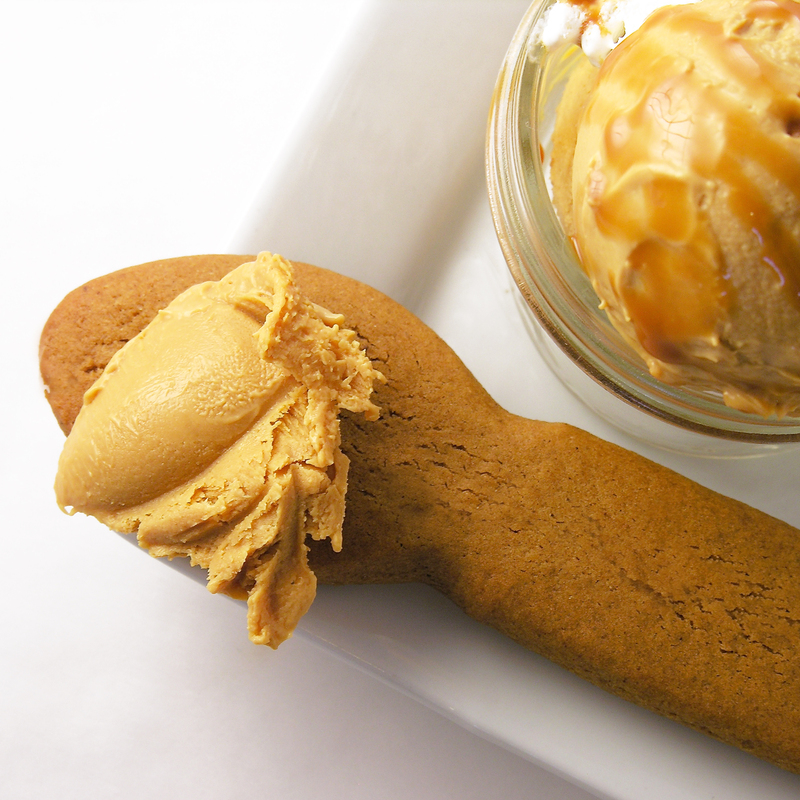 Leave a little room for the cookies to spread. Bake for 10 to 14 minutes until the edges are firm. Gently slide parchment paper off of cookie sheet and onto a flat surface. Cool completely before moving- this allows the cookie to “set”. Frost as desired. I used royal icing in a zip-top bag with a corner clipped off to decorate these. 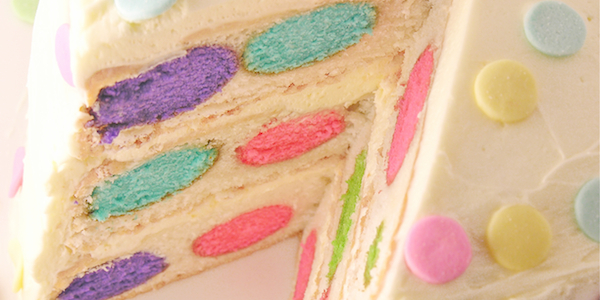 You can click here for my royal icing recipe and instructions for use. You could also use regular icing or even melted white chocolate. 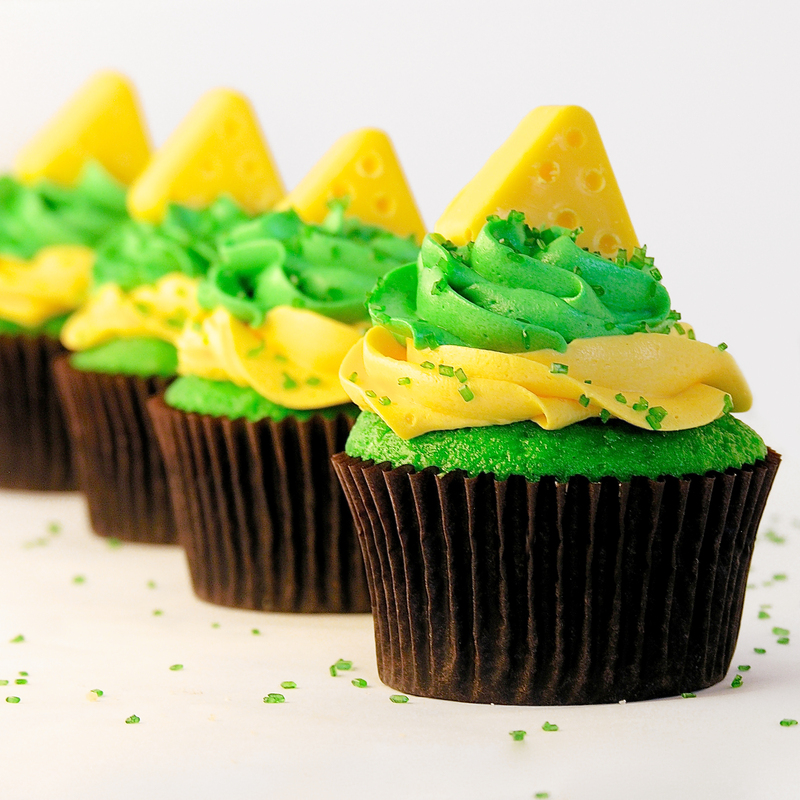 Allow icing to harden up before stacking. Posted in Cookies and tagged baking, chocoate, chocolate, cocoa, cookie cutters, cookies, cut-out cookies, dessert, football, fun, Green Bay Packers, idea, NFL, party, sports, tailgate. Bookmark the permalink. 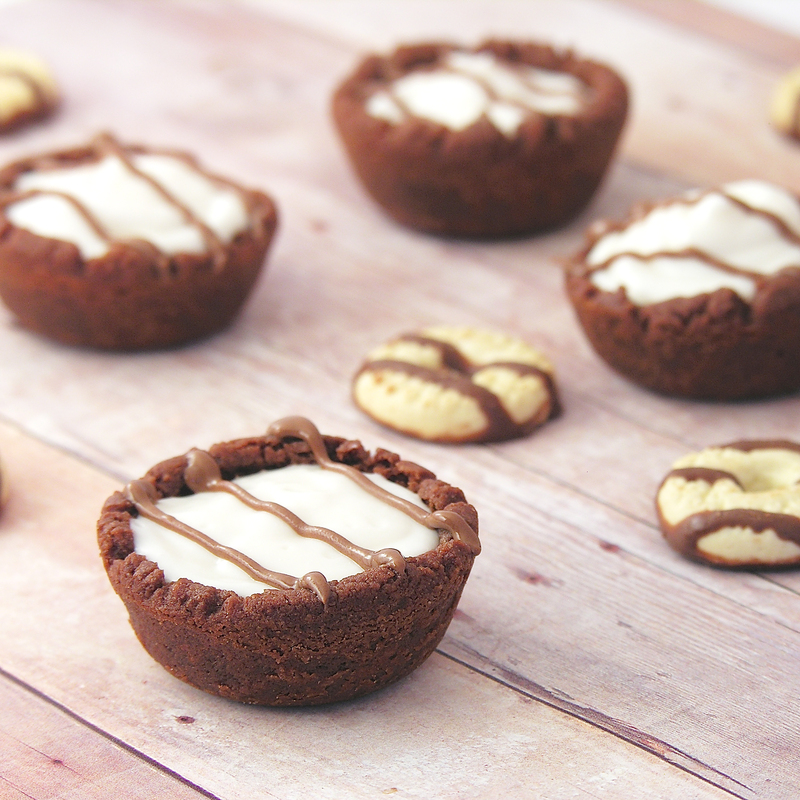 These dark chocolate cups have a surprise inside: a crunchy little fudge stripe cookie! I just love those fudge stripe cookies. Even when I am trying to watch my calorie intake, I get the little 100 calorie packs as a treat. They are just soooo yummy! 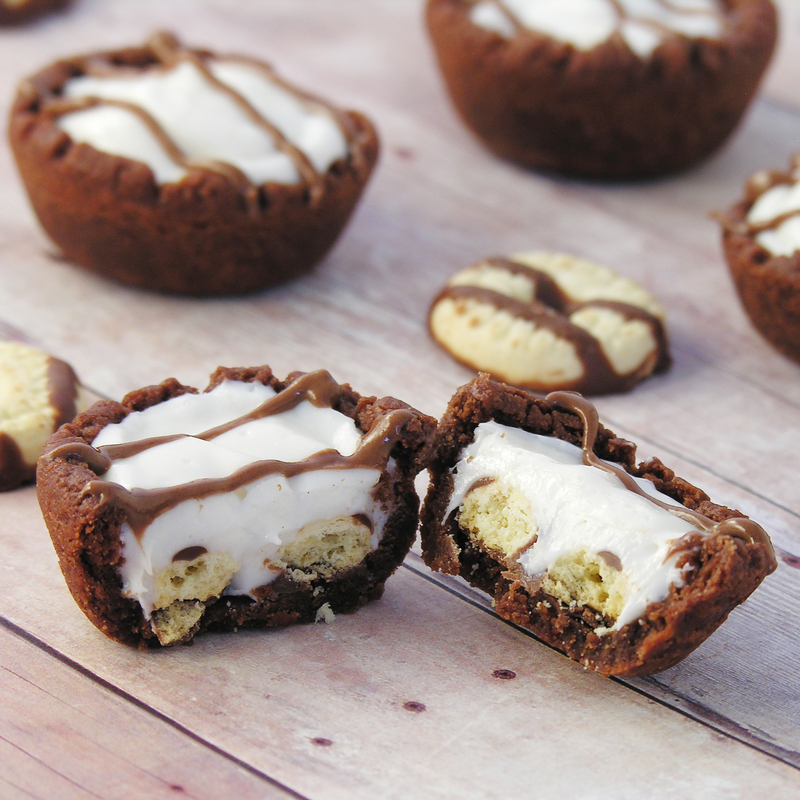 Those little mini cookies were the inspiration for these cookie cups. 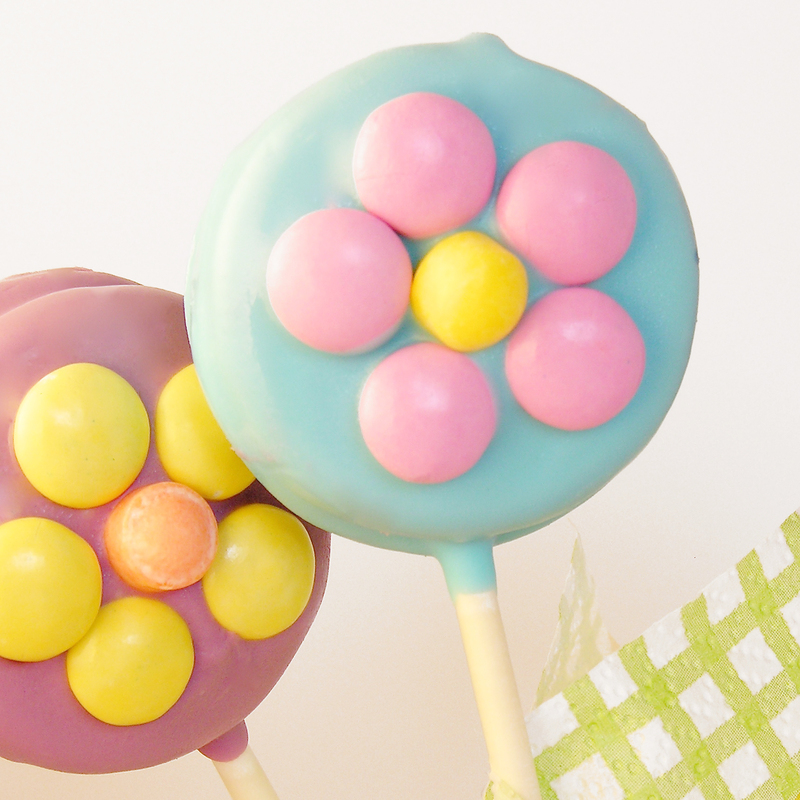 They fit perfectly inside, and make for a wonderful surprise when you bite into one! So much fun! Best use of diet food EVER! One tub of vanilla frosting. 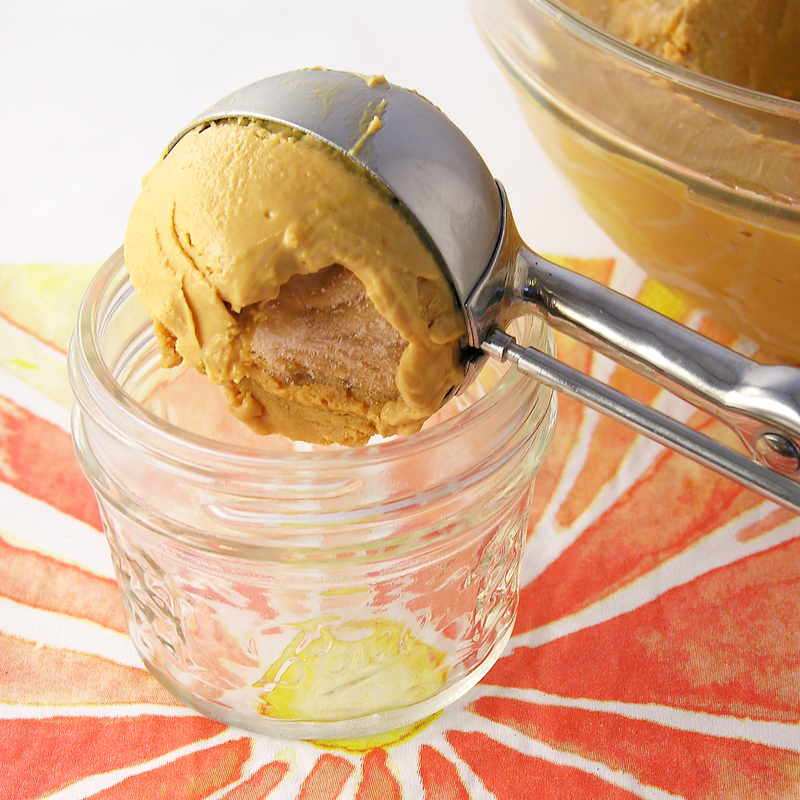 Spoon frosting into a small bowl and microwave for 20-30 seconds, until soft. Stir until smooth. Pipe chocolate stripes on top to decorate. Allow frosting to firm up. 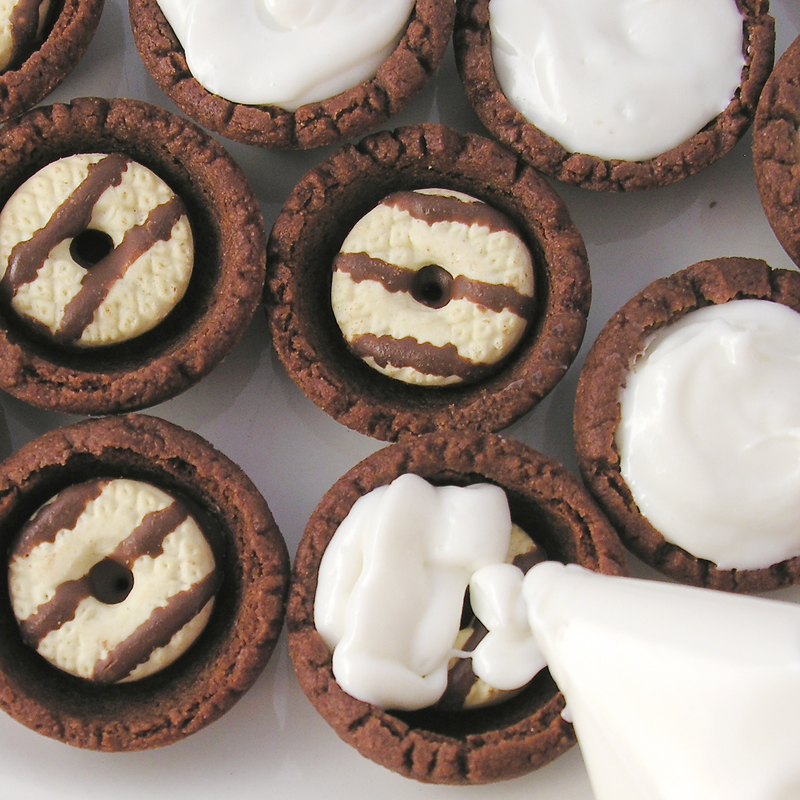 Posted in Cookie Cups, Cookies and tagged cookie cups, cookies, creative, dark chocolate, dessert, food, fudge, fudge stripe cookies, idea, mini dessert, party, recipe, sweets, unique, vanilla frosting. Bookmark the permalink.